Do you like to run, cycle, skydive, mountain climb or attend wine or dessert tastings? Join or support an event and help raise funds to support breakthrough science at Duke Cancer Institute. Below are some of the fundraising activities you can get involved in. 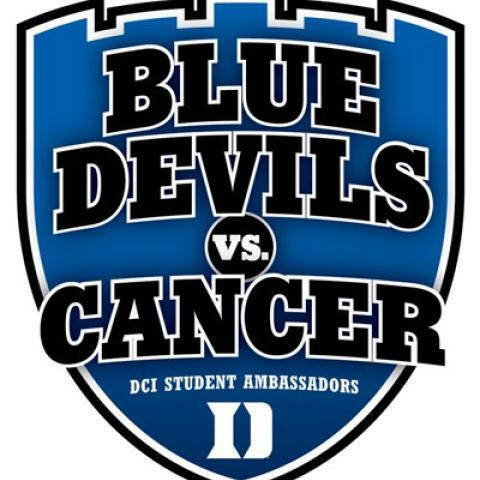 Founded in 2011 by Allison Vernerey, an economics major from France and onetime center for the Duke University women’s basketball, the Blue Devils vs. Cancer DCI Student Ambassadors, host an annual Sweet Night in Durham. The dessert tasting social offers oh so sweet samples prepared by some of Durham’s best pastry chefs. Proceeds benefit the Duke Cancer Institute. The annual BLUM (Beat, Learn, Understand) Multiple Myeloma 5K benefits the Duke Adult Bone Marrow Transplant Program. Begun in 2010, the run was founded in honor of Scott Blum, a Duke patient battling multiple myeloma, a rare cancer that forms in the plasma cells. According to the American Cancer Society, in 2016 there will be 30,330 new cases of multiple myeloma and more than 12,000 deaths due to the disease.Currently, there is no cure. 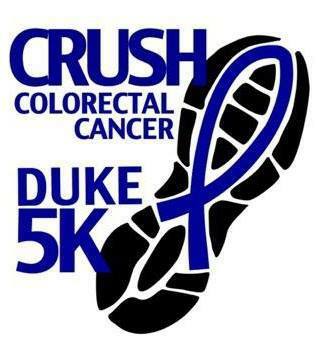 The Duke Multidisciplinary Gastrointestinal Cancers Program hosts an Annual CRUSH Colorectal Cancer 5K Run/Walk in honor and celebration of those whose lives have been touched by colorectal cancer. Excluding skin cancers, colorectal cancer is the third most common cancer diagnosed in both men and women in the United States. According to the American Cancer Society, in 2016 there will be 95,270 new cases of colon cancer and 39,220 new cases of rectal cancer. with an expected 49,190 deaths. Supporting those who support patients with cancer, the Center for Learning Health Care (CLHC) hosts an annual Spring for Support 5K. The Center for Learning Health Care is a research group developing and testing solutions to improve patient care utilizing cutting-edge technologies. It brings together several existing programs at Duke and provides a platform for several new specialized cores, creating an innovative hub for investigators and academic entrepreneurs. Money raised by the Run/Walk supports the Duke Cancer patient Support Program (DCPSP), which provides services and resources to help support patients and their loved ones. Founded in 1994, the annual Angels Among Us 5K and Family Fun Walk raises money to support brain tumor research at the Preston Robert Tisch Brain Cancer Center at Duke Cancer Institute. More than just a fundraising event, it is a day for our patients to connect with other patients who are also on this journey and, together with their family members, caregivers and supporters to have a special day to celebrate life. 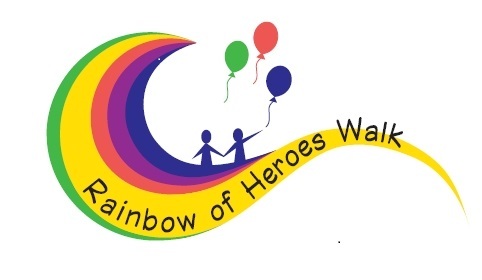 The Rainbow of Heroes Walk commemorates and celebrates all Duke Pediatric Blood and Marrow Transplant (PBMT) patients and their families. Refreshments, music, and activities for everyone are provided. The Walk is not only the main fundraiser for the Duke PBMT Family Support Program. More than that, it is a reunion for patients, families, nurses, therapists, doctors, volunteers, and supporters who have come to know each other through the months-long transplant process. The event includes a carnival featuring games, bounce houses, refreshments, and a Rainbow Raffle. The next walk event will take place on Saturday, May 6, 2017. 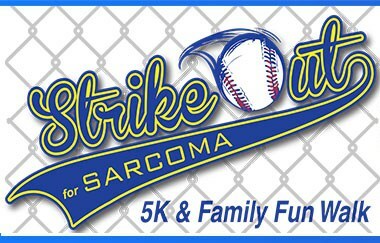 The Duke Multidisciplinary Sarcoma Research Program hosts an annual Strike Out for Sarcoma 5K and Family Fun Walk to honor and celebrate those whose lives have been touched by sarcoma. In addition to the Run/Walk, the event features post-race refreshments and fun-filled activities. The American Cancer Society estimates that there will be more than 12,000 new cases of soft tissue sarcomas diagnosed in 2016 and nearly 5,000 people will die. 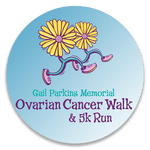 The annual Gail Parkins Memorial Ovarian Cancer Walk and 5K Run, was founded in honor of Gail Parkins, who passed away from ovarian cancer, to raise awareness about the disease and to help fund ovarian cancer research at Duke. Concurrent with the walk and run, Duke doctors and researchers host a yearly on-site educational forum and there's a kids area a kid’s area with inflatables and balloon animals. Registration also includes a t-shirt and breakfast and lunch from local vendors. 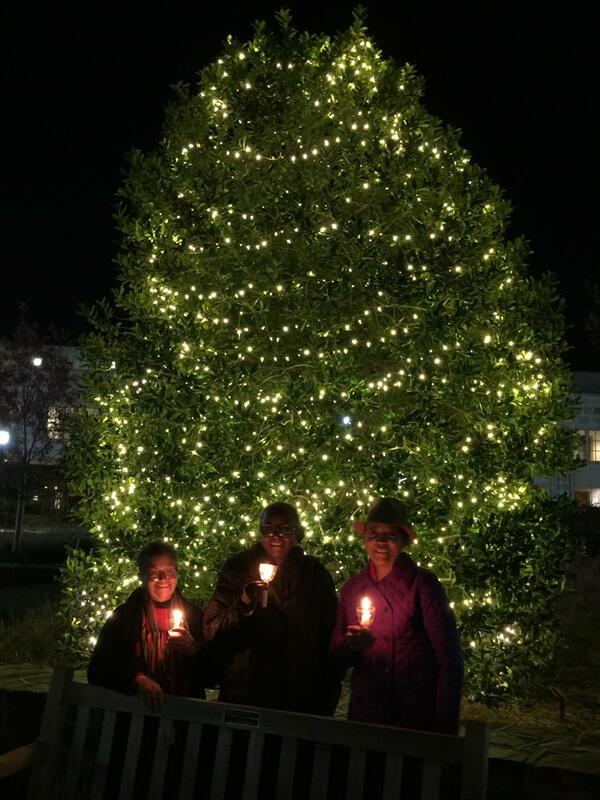 The Duke Cancer Patient Support Program (DCPSP) hosts an Annual Tree of Hope Lighting Ceremony in the atrium of Duke Cancer Center. The Nancy Weaver Emerson Tree of Hope and its many lights symbolize the strength and hope felt by those living with cancer. Duke patients and their loved ones are invited to honor and remember family and friends by sponsoring a light(s) on the Tree of Hope. Corresponding tribute cards (one for the donor and one for the honoree) are given to donors. Lights can be purchased at the Belk Boutique located on Level 0 in Duke Cancer Center. Proceeds benefit the Duke Cancer Patient Support Program. 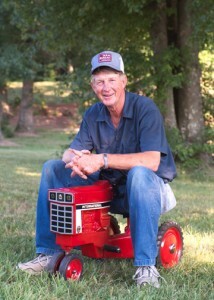 Bob Norris, 83, from New Bern, North Carolina, was diagnosed with lung cancer in 2003. Before that, his wife and adult son both died from lung cancer. 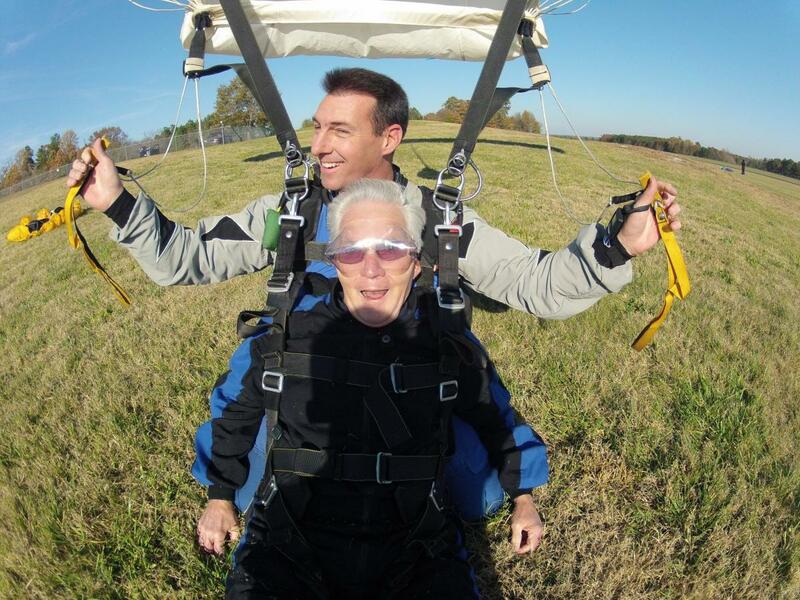 Currently cancer free, he skydives annually to raise money for cancer research. For more information or to donate, visit the official Bob Norris DCI fundraising page. Summit for Cancer was created by climber and mountaineer Barrett Whitten in order to raise awareness and resources for cancer treatment research by medical oncologist Michael Morse, MD, FACP, MHS. In conjunction with Duke Cancer Institute, Barrett began a campaign to climb The Seven Summits. 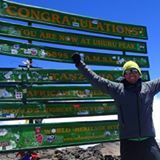 Whitten's campaign to summit the highest peaks of all the world’s continents was successfully started with his Summit of Mount Kilimanjaro, the world’s highest free standing mountain, on Sept. 16, 2013. Since 2010, Skeeter's Foundation has hosted an annual golf tournament called Skeeter's Lazy Links Golf Tournament. Skeeter’s Foundation raises funds to give to other organizations engaged in the research, prevention and treatment of lung cancer as well to support those diagnosed with the disease and the families and friends of the patient. For additional questions regarding giving opportunities to Duke Cancer Institute, please email dcidevelopment@duke.edu or call 919.385.3129.